Every time I discover a new review of my books, my hands sweat and my heart thumps quickly. It’s always a little scary to see what a reader thinks of the worlds I’ve created. Perhaps they won’t like my story or language or characters or… Well, you get the idea. I really appreciate my readers, and I try to not only please myself with my tales, but also, those people who part with a few dollars and open the (real or virtual) pages of my books. I’m thankful for readers and for their support, both when they purchase my books and when they take the time to review them. “A fantastic collection of short stories about the hazy boundary between our world and the hidden faerie world, with roots in archetypal fables (the good get rewarded, the bad get punished), but with branches extending into a more modern setting. Judging by the cover, I gather the author is also an accomplished artist, but sadly the interior illustrations were not made available in the Kindle edition. I wish I could have seen them.” – Mark Taylor (Sorry Mark, Kindle versions usually don’t include illos. 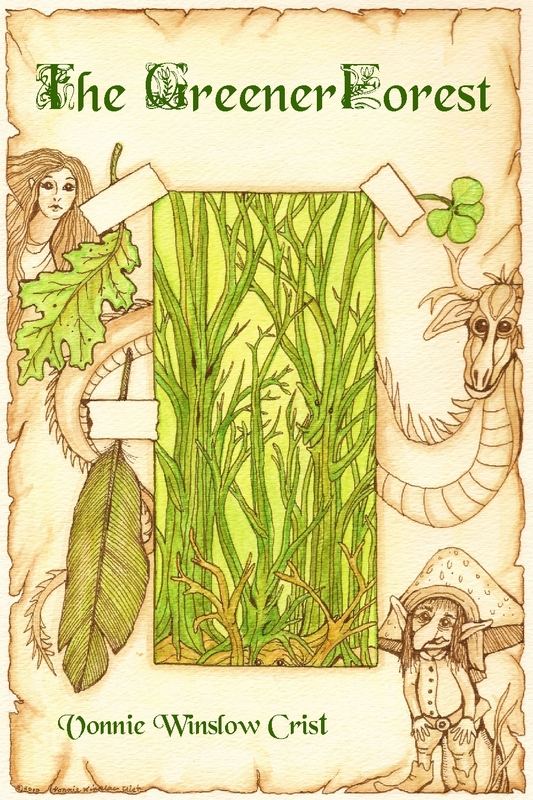 You can see some of the illos included in The Greener Forest on my website). And a link to a post with earlier reviews of The Greener Forest. Intrigued? Why not buy a copy? 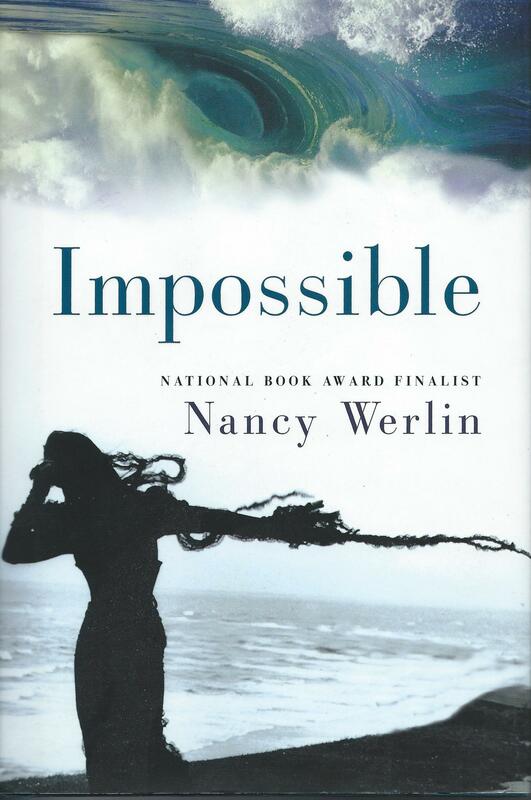 This is the 3rd week I’ve shared links to some of the articles posted recently about adults reading YA. If you missed the previous posts, here are the links: Against YA and More YA Discussion and Adults Read YA Books and Read What You Want and YA is Good for Adults. Thursday, I’ll share the final post (for now) in this series about the adults reading Young Adult books bruhaha. I hope you’ll stop by and take a look. I believe illustrators and writers alike should strive to paint the spirit and soul of what they see – whether through words or watercolors. I know I do. By the way, I took this photo of Brian at an East Coast FaerieCon. (Thanks Faerie Magazine for inviting me to attend). And I must mention, I’ve been collecting work illustrated by Brian Froud for years. While at FaerieCon, I asked him to sign a book or 2. He saw my bulging knapsack, and realized all books in the bag were illustrated by him – so he told me to leave the knapsack and stop by later. I did so, and much to my amazement, in each book was a small goblin drawing by Brian beside his signature. I hope I will always treat my fans as kindly. Yikes! Trees as a character. So, I thought about what sort of person trees might care about. 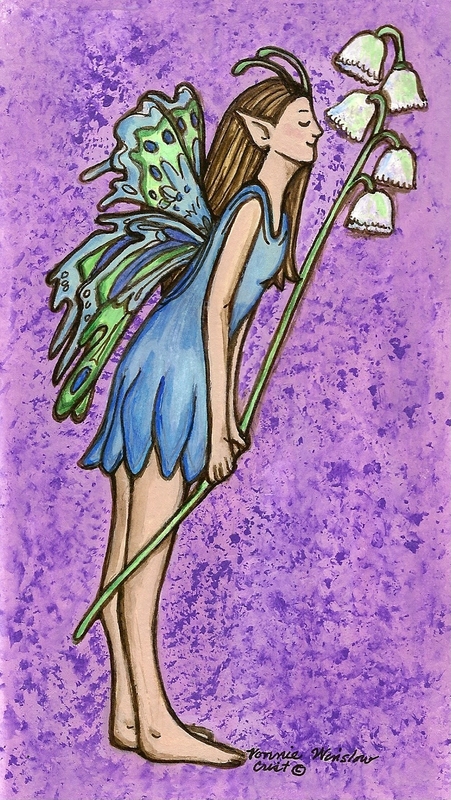 I’d used fairies, a Brown Man, she-elf, applehead gnomes, swan maidens, mermaid, dragon, Mud people, and other nature spirits in the book’s stories already. I needed someone different. While leafing through A World of Baby Names [T. Norman] trying to find a name for a main character that might spark a tale, I spotted, Berg: “Directly derived from berg (mountain).” Woot! I’d found my name and my Faerie race: a giant. I decided to write against type, and make my giant kindhearted. But where would a giant go to interact with others and why? My answers: a zoo, because he likes to hunt animals – with a camera, of course. What kind of job would a giant have? That’s easy – one where he counts gold, or in this case, money. So I made Berg an accountant. Besides being tall with big hands and feet, I also gave him the “typical” large, scary, yellow teeth readers associate with giants. But Berg is embarrassed by his ugly teeth. Next, I need someone who chooses to interact with a giant. A damsel in distress seemed a reasonable choice. My damsel, Shelly, is a woman babysitting her nephew. Since opposites attract, I made her short and good with words rather than numbers. And here’s where the trees come into the tale. From placing a wire-like rootlet on the path so the stroller’s wheel gets tangled, to pushing up the sidewalk with a root and tripping Shelly, to shoving a teen into the grizzly bear pen – the zoo’s trees play an active role in the love story. And, yes, it is a love story. When Editor Katie suggested giving away one of my stories as a gift to my readers, Blame it on the Trees seemed a natural. Now, I needed cover art. I’d done a watercolor (with a few inks & a touch of acrylics) called Poet’s Moon which seemed perfect. A small square of the painting had been used by Scifaikuest as the cover art for their February 2012 issue, but over half of the painting remained unpublished. That half was filled with trees in the pinks and purples one often associates with Valentine’s Day. So – a belated Happy Valentine’s Day to my readers. 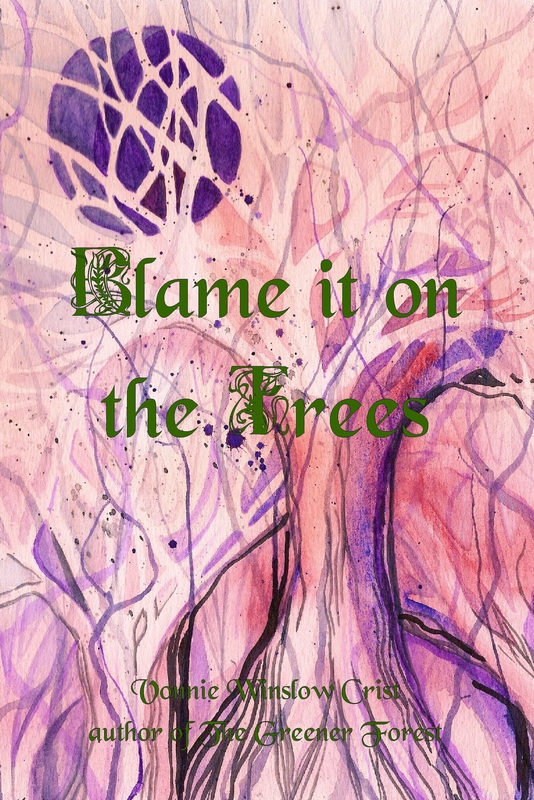 Visit http://tinyurl.com/vonnies-blame-trees-story for your FREE copy (or enjoy it as the last story in The Greener Forest should you like to read more magical tales). There is a time limit on the FREE, but I hope to have the eBook available for those who want a quick read for quite some time. And should you decide to read either Blame it on the Trees or The Greener Forest, I hope you’ll take the time to “Like” the book and give it a brief review. Thanks, readers. I really do appreciate your support. We’re right in the middle of National Magic Week – when it seems all the world acknowledges that magical things are still possible. And I think it’s no coincidence that Halloween is just a few days away. 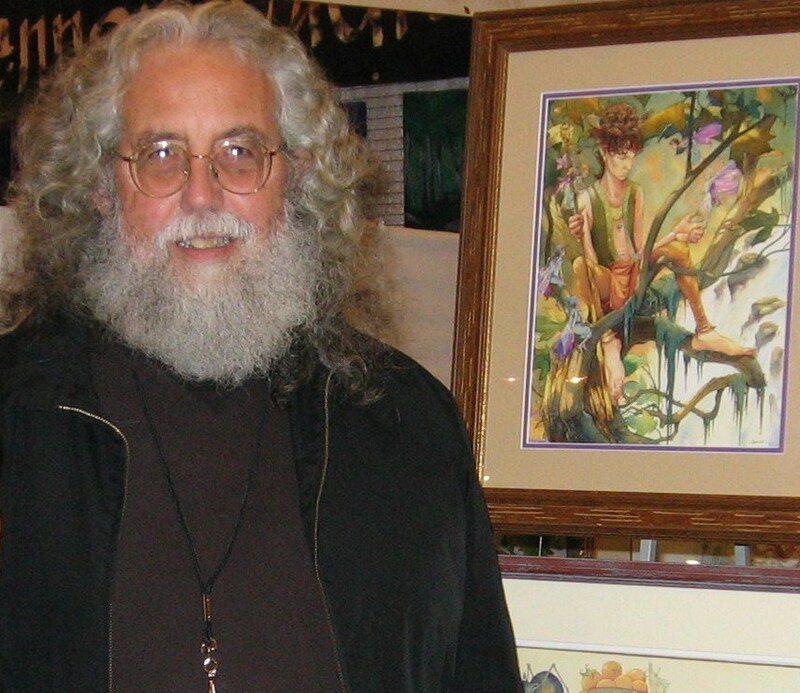 But rather than magic in general, I’d like to celebrate the illustrators (like Gary Lippincott pictured here) I met at last year’s FaerieCon who bring their visions of the usually hidden worlds of fairies, elves, trolls, giants, and such to the reader. I’m one of those devoted readers and appreciators of illustration who drags a knapsack worth of books to a conference and patiently stands in line for the signature of the artist or author. 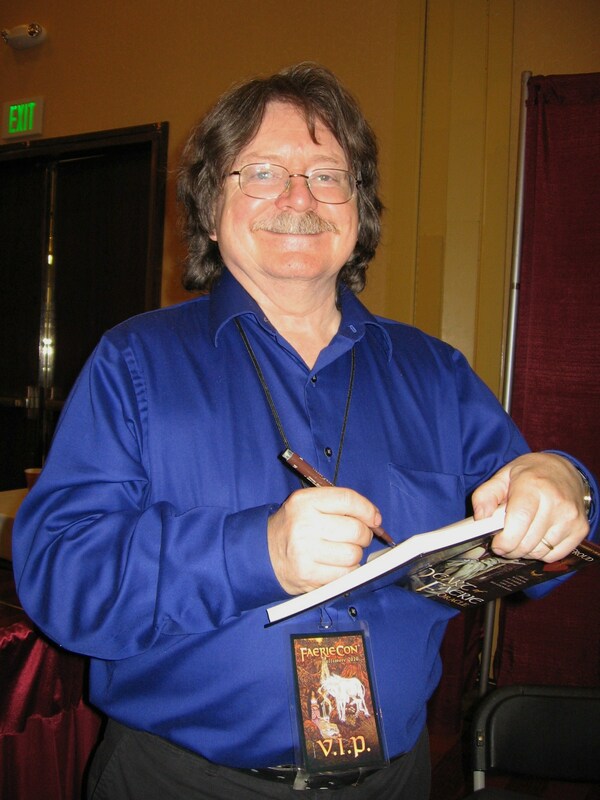 FaerieCon, held this year November 4-6 in Hunt Valley, Maryland, is a great place to meet these artist-magicians. 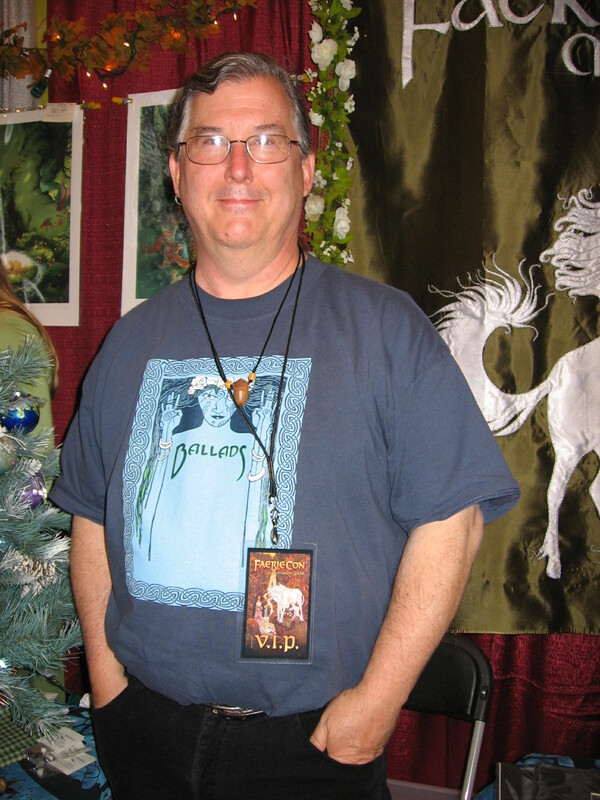 Last year, I met the gracious Michael Hague (see my Jan. 6, 2011 blog) and the fabulous doll-maker, Wendy Froud (see my Dec. 12, 2010 blog) – but they weren’t the only artists I chatted with. Brian Froud (pictured on the left), Wendy’s husband and perhaps the most well-known fairy artist working today, spoke as part of several panels and shared his delightful tales of bringing Faeriefolk to life. And if you took the time to stop by and visit with the Frouds, both Brian & Wendy signed their books and chatted amicably with their fans. Faerie Magazine, www.faeriemagazine.com , usually hosts several illustrators and authors at their FaerieCon booth. 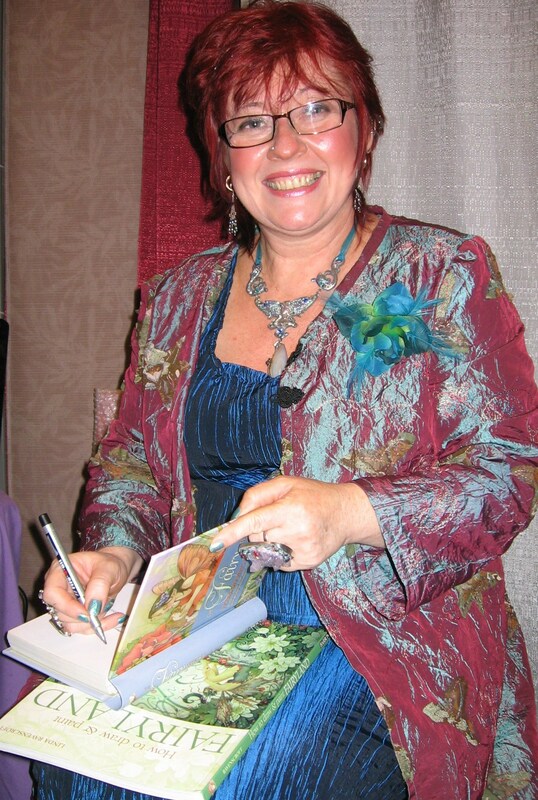 Last year, the colorfully-dressed and always-smiling Linda Ravenscroft signed 2 books for me. She seemed happy indeed to converse with her many fans as well as talk a bit about her art. (Linda is pictured on the right). For those who decided they wanted to know more about the business of illustration, businesswoman and illustrator extraordinaire, Jessica Galbreth, gave a workshop. Not only did Jessica tell the audience about the ins & outs and ups & downs of life as an illustrator, wife, and mom – but those who registered for the workshop also received a copy of her Artists Manual. And as the owner of an autographed copy of that manual, I can tell you it was a worthwhile workshop. (Jessica is shown to the left). And lastly, but never leastly, Charles Vess, autographed 2 of the Neil Gaiman children’s books he’d illustrated, for me to give as Christmas gifts to my daughter. This year, Charles has a wonderful painting that will be displayed at FaerieCon. For those who’re interested, you can see the progress of the enormous painting on Charles’ facebook page. I’ve already got my copy of a book of his magical art ready to take with me to hopefully get autographed when I visit FaerieCon in a little over a week from now. (That’s Charles in the photo to the right).